Sueharu Fukami, born 1947 in Kyoto is one of the world's leading porcelain sculptors. 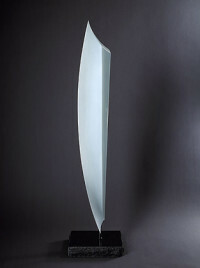 He is often associated with his distinguishing porcelain slip-casting technique and the supple curves and sharp silhouettes of his abstract porcelain works. Fukami studied ceramics at the Kyoto Arts and Crafts Training Center and graduated in 1965. In 1985, he participated in the Premio Faenza and won the grand prize. One year later, he held his first international solo exhibition in Faenza, Italy, which established his international reputation. His works are displayed in over 40 different public institutions such as the British and V&A Museums in London, the Brooklyn Museum and the Art Institute of Chicago, among many others.